The state government will fast track a new train line to Springfield in the wake of its recent announcement that nearby Ripley would be one of three new "cities" in south-east Queensland. 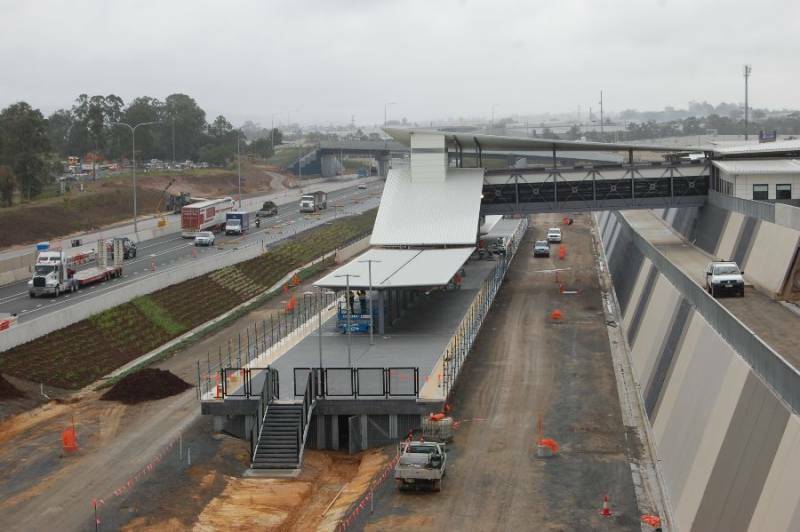 brisbanetimes.com.au can reveal the new rail line from Richlands train station, west to Springfield, will be fast-tracked to be completed in 2013, two years ahead of its planned 2015 completion date. The plan will be contained in tomorrow's State Budget and follows Premier Anna Bligh's announcement last month that three new population centres would be constructed in the south-east corner. "We're going to work with those councils in Logan and in Ipswich, with the Urban Land Development Authority using its powers to bring forward the planning approvals and bring these projects to the market much sooner than the councils could," Ms Bligh said last month. The first stage of the Darra to Springfield Transport Corridor will allow the Centenary Highway to be widened from two lanes to four lanes from Darra through to the Logan Motorway. That project will also include a new 3.6 kilometre rail line from Darra, over the Ipswich Motorway, to a new train station being built at Richlands. 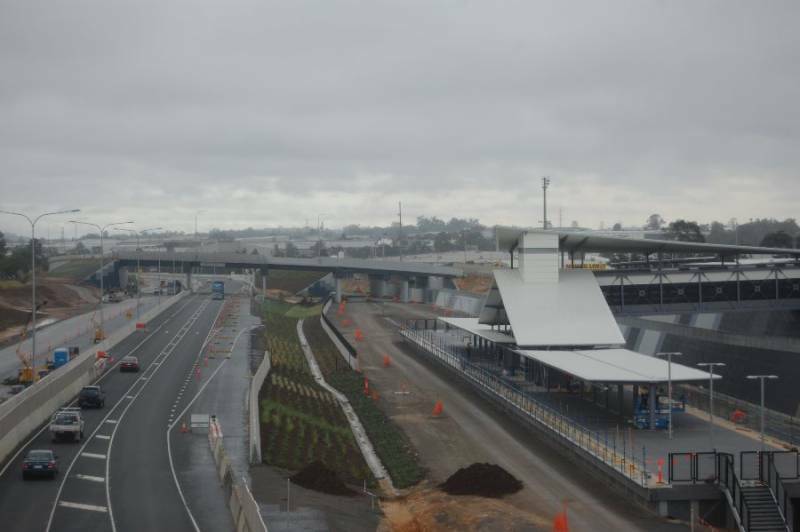 The state government plans to have the project's $800 million first stage, where the rail line reaches Richlands, completed by 2011 and the four-lane Centenary Highway to reach the Logan Interchange by late this year. However, the first stage is already 80 per cent complete and five months of rail work started last month. Stage two will extend the rail line to Richlands and the Centenary Highway widening to Springfield. brisbanetimes.com.au understands negotiations are underway to bring the project's completion date forward by two years to 2013. "That would be sensible speculation," a government source confirmed on Friday. 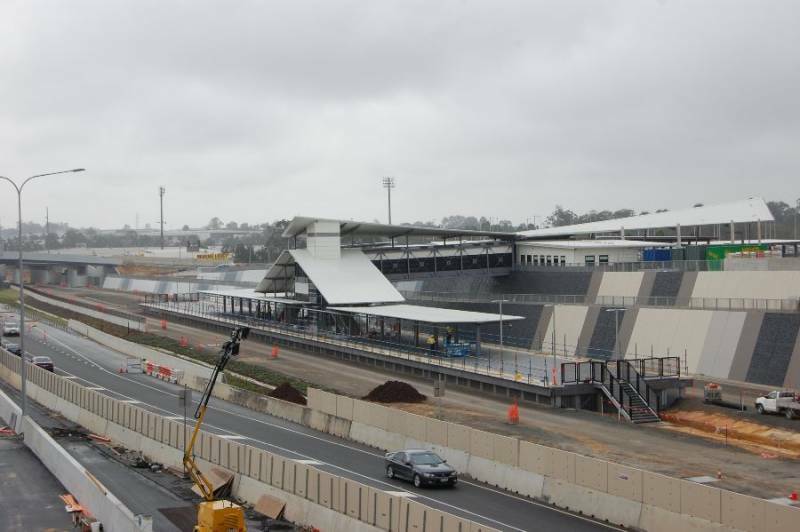 Public transport lobby group Rail Back on Track spokesman Robert Dow said it made economic sense to bring forward the project, given stage one of the project was 80 per cent complete. "Construction to Richlands is ahead of schedule and it would make sound economic sense to continue with the present construction force," Mr Dow said. "Stopping and starting is very expensive." Queensland Rail plans to build a single rail track from Richlands to Springfield, but Mr Dow called for a dual line track. "We think that it should be double-tracked all the way to Springfield, mainly in view of the Ripley Valley announcement," he said. Mr Dow said new stations should be built at Ellen Grove and Springfield Lakes while the project team was in place, rather than retro-fitting rail stations. He said the experience of the Gold Coast rail line, where a second rail line was now being added, proved the folly of not building suitable rail infrastructure in the first place. The Gold Coast rail line was closed in 1964, but was re-opened with new stations built at Helensvale in 1996, Nerang (1997), Robina (1998) and Varsity Lakes last year. In the past five years, the state government has been forced to double the number of tracks between Ormeau and Coomera and from Helensvale to Robina at substantial cost. Ripping up the Gold Coast Line - what a great TERRIBLE idea. Understand the Premier, the Minister for Transport are out at Richlands station for an official announcement. Also, I have sought confirmation about the track. Advice from Ministerial staff is that it will be dual track to Springfield. But at this stage stations at Ellen Grove and Springfield Lakes not confirmed. As construction develops this may change. Great news. I expect going back later to put in stations as side platforms isn't nearly as much hassle as duplicating bridges. It was the thinking at the time though. Didn't that occur also with the Cleveland and Samford lines? What I can't believe is that they didn't see the value of electrification until 1979. I suppose that applies to Adelaide and Perth too. 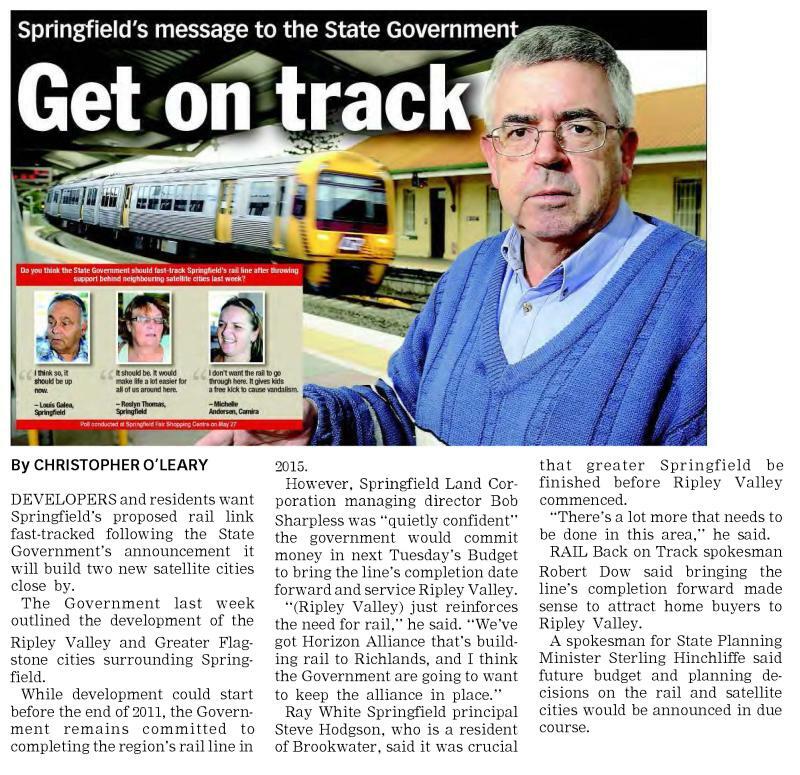 THE State Government plans to fast track the new $646 million rail line to Springfield in tomorrow's state budget. Ms Bligh said the budget would include funding to accelerate the rail line extension from Richlands to Springfield, southwest of Brisbane. The 10-km line will now be open by 2013, two years ahead of schedule. Ms Bligh said projects like this one could only be delivered due to the government decision to sell state assets. She said tomorrow's budget would deliver more infrastructure projects. To date about $2.4 billion of investment has gone into the Springfield development, including technology, education, health, retail and transport facilities. It has a population of around 18,000, which is expected to rise to 86,000 by 2030. Managing population growth, boosting public transport and protecting the environment will be a major focus in tomorrow's State Budget with Premier Anna Bligh today announcing construction of a major new rail line would be brought forward by two years. Ms Bligh said the State Budget would include funding to accelerate the new $646 million 10km rail line to Springfield by two years. Work is already underway to extend the region's rail line from Darra to Richlands. "Before the last election we said infrastructure investment and the jobs it supported were our top priority," Ms Bligh said. "Bringing forward the extension of the rail line all the way to Springfield will give its 18,000 residents access to world class public transport. "And it will mean a massive investment in jobs, public transport and the environment." Work is already underway to extend the region's rail network from Darra to a new station at Richlands. Work on the stage one of the project began in 2008 and is expected to be completed next year. It includes 5km of new rail line and 4km of road upgrade. The Richlands railway station will include a 650 space carpark. 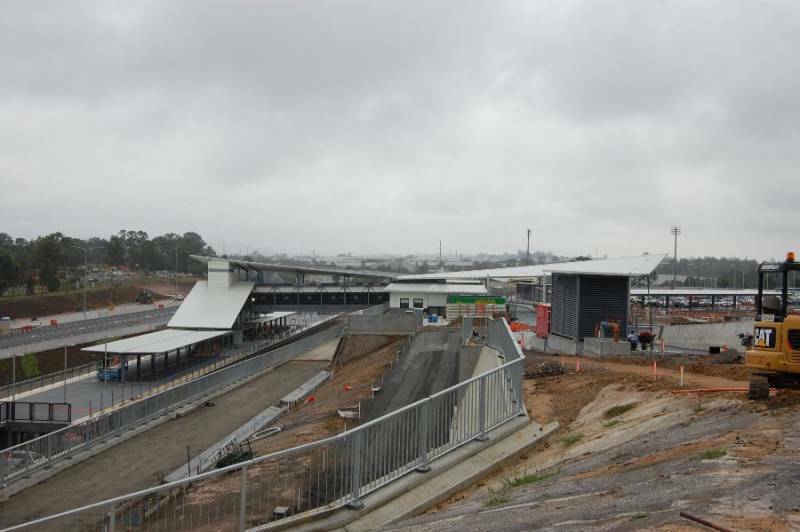 Ms Bligh said special new local bus services would be established when the new Springfield rail station was operational to encourage commuters to take public transport all the way to work. "Quality public transport like this not only means that people can live further away from the city without having to drive but it also delivers major environmental wins as well," Ms Bligh said. "The new line will provide a direct link between Springfield and Brisbane which will mean a lot to the local community - better access, cheaper travel, less congestion, and fewer delays. "Our government believes in public transport - as a means to get people out of their cars and where they need to travel faster, to cut congestion, reduce greenhouse gases and manage growth. "We're already investing almost $400m to build a new line from Darra to Richlands and getting the rail line to Springfield as soon as possible is a priority." The new Springfield rail line could be open by 2013, two years ahead of the current schedule. The 2010-11 State Budget includes $104 million to complete the new rail line from Darra to Richlands and $25 million to complete the third track from Corinda to Darra. Ms Bligh said the bring-forward of the rail line to Springfield showed the State Government's commitment to its go west for growth strategy. "We've been consistent in our approach to directing growth to the western corridor," Ms Bligh said. "And we've already secured a corridor next to the Centenary Highway from Springfield to Yamanto for a future rail line." From the ABC News click here! Treasurer Andrew Fraser says asset sales and other budget measures will enable the Queensland Government to finish the rail line to Springfield, west of Brisbane, two years early. 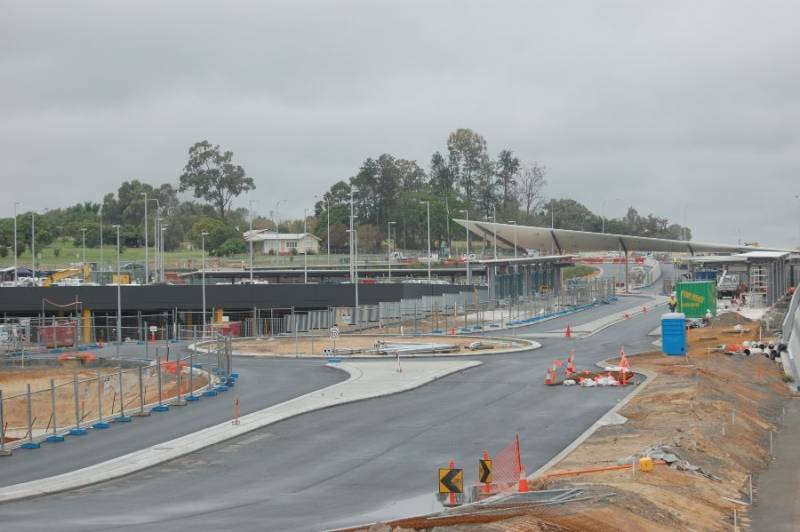 The rail line to the Springfield community south-west of Brisbane was scheduled to be completed in 2015. Mr Fraser says managing population growth and boosting public transport will be a State Government priority next financial year. "Tomorrow's budget will deliver a building program that Queensland needs for growth," he said. "This decision today to bring [the project] forward means that we can extend the railway line to Springfield and bring it forward to deliver it by the end of 2013. "What that does is build a public transport culture before you build the road culture." 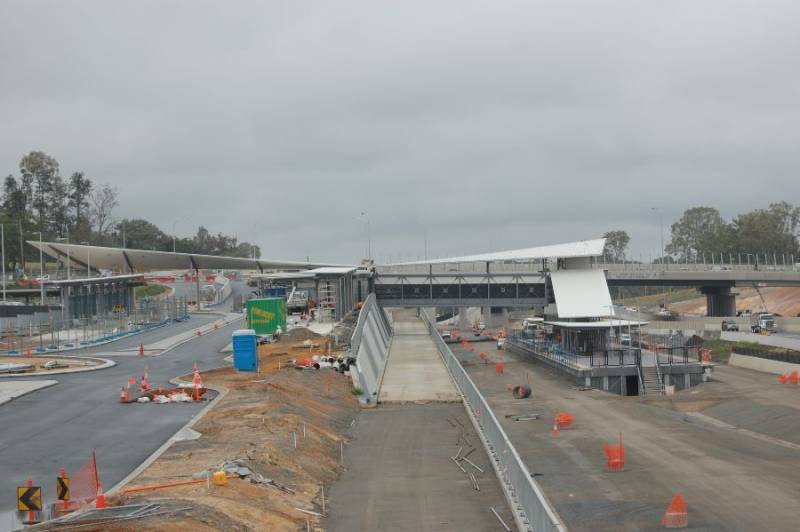 Meanwhile, the South-East Queensland Council of Mayors (SEQCM) wants the State Government to set aside almost $11 billion over three years for high-priority projects, including the Toowoomba bypass, as well as the Brisbane and Gold Coast rail upgrades. SEQCM chairman Lord Mayor Campbell Newman says upgrading Brisbane's inner-city rail network is the most important project. "It's really vital so that actually the whole rail system works across the region," he said. "There's currently a bottleneck with the river and it's not until we get this inner-city rail in place that rail services can be improved to places like Caboolture and south to the Gold Coast." Councillor Newman says the region's liveability is at stake. "We had an Access Economics report done which indicated that there's probably going to be greater flexibility in the state budget than was projected last year, so we think the infrastructure spend should be maintained," he said. "We need the bus ways, the railway line upgrades, and the roads to all proceed along with other community infrastructure like hospitals and schools. "This is not the time to drop off spending." How about just building the rail line, non grade separated road instead of freeway and build more rail line with the money saved. Let's just try building public transport first. The result might surprise us all. Howvabout just building the rail line, non grade separated road instead of freeway and build more rail line with the money saved. Let's just try building public transport first. The result might surprise us all. That would be political suicide in Queensland. It just ain't gonna happen! Then our region is headed for an ugly, polluted, gridlocked, bankrupt future and we will pay through the nose for it. No Thanks!!!!!! The successive governments will eventually have to change their car obsessed policies, but sadly it will be a slow process, probably only accelerated when fuel prices skyrocket. We have a situation where the government is doing the minimum possible to attract people to public transport, an opposition party with no credible transport policies that puts very little pressure on the government over PT issues, and press organisations that don't seem to care about Brisbane's lacking public transport. SE Queensland sadly has a very long way to go! This is GREAT news! Something is better than nothing! The proposed extension of the Springfield line into the Ripley Valley to meet the transport needs of the Super city that the current government has proposed will make necessicary the electrification of the fourth track between Corinda and Darra to meet the needs of commuter traffic alone without the freight traffic over this line which is presently increasing and will continue to do so until such time as the southern freight bypass line is built, the failure to electrify this section and build the fourth platform at Oxley is shortsighted penny pinching by ill advised or incompetent bureaucrats and advisers? Revisit this site in 2016 and see how wrong the government has been in relation to its approach to the provision of infrastructure for public transport and the provision of services. We have some of what we want though, and largely it's the most important aspects. The line all the way to Springfield, and as double track. I think this aspect is to be applauded. I'm still unsure why they think the line doesn't need the two stations though. To be honest, I think the penny pinching applies to the road networks too. For instance, they could easily fix the Toowong roundabouts by making them triple lane and three lanes until Sylvan Rd. Similarly, North Quay heading south should really have been uninterupted freeway rather than the two sets of lights for those who want to use the Riverside expressway. Moggill Rd past Kenmore should really have been 4 lanes all the way and dual carriageway when Moggill and Belbowrie was developed. Same with the south end of the Centenary Freeway. I expect there are numerous other examples. Some of the problem here is nearly all the jobs which aren't in the CBD are nearby. Places like Woolloongabba, Milton, Fortitude Valley, UQ St Lucia don't make the transport task any easier as you pretty much heading to the city to get there anyway. Ipswich is really the only place which has a reasonable number of jobs and doesn't stress the transport infrastructure. SEQ: Next station is Springfield! RAIL Back On Track (http://backontrack.org) a web based community support group for rail and public transport and an advocate for public transport commuters has welcomed the announcement by the Premier (1) that the railway line presently being constructed from Darra to Richlands will be now be fast-tracked to Springfield. "Rail is the safe, sustainable, efficient high capacity mass transit system for the long haul. The announcement yesterday by the Premier that today's budget will confirm funding for the fast tracking of the railway line from Richlands to Springfield is outstanding news. It will also tap into the increased capacity on the western line as a result of the Corinda to Darra track amplification." "RAIL Back On Track has long suggested that the original concept for a single line from Richlands to Stepham was not desirable (2). We are delighted to learn the the line from Richlands to Springfield is now to be double track all the way!" "We believe it would be preferable that the planned stations at Ellen Grove and Springfield lakes be built as part of the 'green-field' construction." "Nonetheless, it is very welcome news that trains will soon be running through to Springfield!" The new train line from Richlands to Springfield will be dual track, Transport Minister Rachel Nolan confirmed last night. The decision will prevent delays and allow more trains to use the track between the two stations. Public transport lobby group Rail: Back on Track and Ipswich City Council had pressured the state government to revise their original plan to build one rail line from Richlands and Springfield by 2015. In the past, both parties said building one line simply meant the Government would have to come back and add extra rail line track when it was more expensive in the future. Ms Nolan said Government had changed their original concept and would include the link between Richlands and Springfield as dual line. "The dual track line to Springfield comes in addition to the current project which will create a third electrified track from Corinda to Darra by the end of the year," Ms Nolan said. "That means more trains, including more express trains, will be able to get through. "Trains servicing that area can move more frequently and independently of each other. It will allow for better on-time running and more reliable services. "In other words, it will effectively free up movement in both directions. Trains will no longer be in a holding pattern." Infrastructure Association of Queensland executive director Paul Clauson last night welcomed the announcement. Mr Clauson said the decision showed genuine financial commitment. "This is a positive development for the south-east corner given the population growth and the government's intentions to develop satellite cities in the western corridor," Mr Clauson said. Last month, Premier Anna Bligh announced three new satellite cities - including Ripley Valley outside Springfield - would be fast tracked to cope with population growth. brisbanetimes.com.au revealed yesterday that the State Government planned to bring forward the second stage of the rail project forward by two years, until 2013. Today's Queensland Budget will contain $646 million for the Stage Two works, which includes both the rail line from Richlands to Springfield and widening the Centenary Motorway to four lanes all the way to Springfield. The first stage of the Darra to Springfield Transport Corridor, from Darra to Richlands, costs around $800 million. I'm reading unbelievable things in these articles! Don't bother if it wont include Springfield lakes and ellen grove this will then involve expensive retro fitting and mean the stations will be the annoying dual platform style rather than islands. Don't bother?? Yes having the two intermediate stations would be the best outcome, but moving the construction date forward and ensuring 2 tracks are built from the getgo is still better than nothing or just a single track. And what makes a dual platform so much more annoying than an island one? ...is it just me, or is that train rather badly photoshopped in? It is a real photograph, just the angle. You are saying that is a fact but it is not established. Getting a straight edge with an island platform can be more difficult, and an island platform usually requires you to use two sets of stairs. A side platform generally requires that only in one direction. And it's not like you are waiting for a train which might come on either platform in this case. I agree that is an annoying aspect of the up-down-up-down tracks as far as Corinda. An island platform would be nicer at the terminus station, but that's not something which would be affected by this. So if the Springfield Line is going to built dual track, then it's not exactly rocket science that the 4th track between Corinda and Darra will need to be electrified rather soon (as well as the 4th platform at Oxley). Also, surely building platforms at a later date at Ellen Grove and Springfield may cause disruption to the Springfield Line. Given that the Government has just announced $200m for refurbishing existing stations, I find it difficult to see how they could not budget for these two intermediate stations. But we all know that there is no need for stations until the surrounding area is fully developed and the roads congested. Until then there is no demand. Great point! The new stations are far more important than the refurbishments. "Bringing forward the extension of the rail line all the way to Springfield will give its 18,000 residents access to world class public transport"
So where is this world class public transport she talks about...? Or is it a misprint and should really say "third world class public transport"? Of course it is world class when you are driven around by a driver in a limo admiring the high cost transit lane on a freeway that has destroyed every neighbourhood it cuts through. If Anna Bligh thinks that 30mins off-peak and 20mins peak frequency is world class, then she is very much mistaken! ^^^^^ I agree with the above. 1. Ranking among the foremost in the world; of an international standard of excellence; of the highest order: a world-class figure skater. 2. Great, as in importance, concern, or notoriety. Busway would be yes. Rail? Definitely no. An Island platform requires only one set of facilities, toilets, shelters, thicketing facilities etc and is better from the point of security and fare collection, as for it being more difficult to provide a straight platform face on an Island platform being built in a greenfield situation as Ellengrove and Springfield Lakes will be that argument has no credibility whatever. A more logical construction program would see the line extended to Ellen Grove and opened to that point revieving the parking capacity constraints at Richlands and Wacol by providing further parking at Ellen Grove in a shorter time frame then as thw construction continued replicating this with the continued construction to Springfield Lakes and then as a final stage to Springfield itself. Each stage would reduce the numbers of commuters using cars for their entire commute with many being able to use feeder bus services to rail or active transport such as bikes or walking. Well, you can say that if you wish but it seems perfectly obvious to me that if the tracks must separate by the full width of the platforms and then also reverse their curve to become parrallel, that would likely use up more space than side platforms would. Perhaps the island platform doesn't need to be twice as wide as the side platforms though. The point about toilets and ticketting facilities is valid, but they can still be placed in the subway/bridge. In terms of width required if anything the island platform model requires less width than the side platform model due to the leglislated access requirements regarding platform width although the difference would be minimal. Only one track need be curved to divirge to provide space for the island platform and provided the rail corridor is of sufficent width at the station location both platform faces can be straight as at the new station at Richlands. I guess it depends on the length of the diverged piece of track. Still, I don't mind side platforms as at least in one direction you usually don't need to use any stairs. RAIL commuters living in Springfield Lakes better grab a bus timetable rather than pine for a local station, according to State Transport Minister Rachel Nolan. During a Greater Springfield Chamber of Commerce address last Thursday, Ms Nolan said the travel needs of Springfield Lakes residents could be satisfied with better bus and rail connections. She said the State Government was committed to providing a station at Springfield Central as part of the $646 million Springfield rail link to be built opposite the town centre by 2013. But other stations in Ellen Grove and Springfield Lakes must wait until population levels rose. "I know that people would like to see a Springfield Lakes station sooner and I am open to that idea in the future," Ms Nolan said. "Right now there are two reasons not to. One is the $25 million it would cost. In bringing this project forward we are trying to squeeze as much rail line out of our money as we can. We also need to get higher density around our stations and Springfield Lakes doesn't really have that." RAIL Back on Track spokesman Robert Dow said that it would be cheaper to build the extra stations with the line. Grrr. Irritating, but at least they're putting the tracks through in one go, and theres still time to find some extra money and put in the stations and tracks all in one hit.